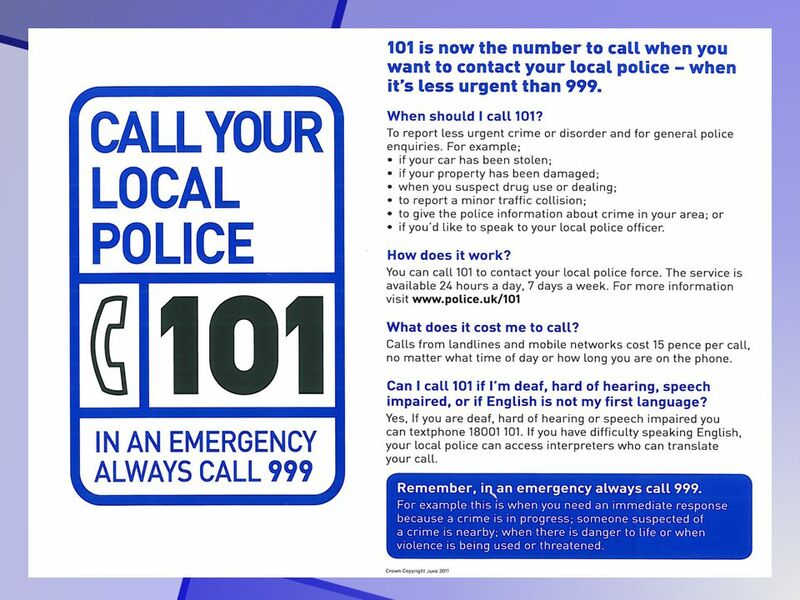 MON 9 th February Y11 Assembly – Main Hall CANCELLED Beaumanor House Assembly – Learning Forum P1/2 Y11 Maths Paper 1 – Hall/Gym 1.10 pm MP6 Club L2 TUES.
4 Thinking of Your Safety Do not give out your personal details to online mates. Personal stuff includes your messenger id, email address, mobile number and any pictures of you. If you publish a picture or video online-anyone can change it or share it. SPAM/junk email & texts: don't believe it, reply to it or use it. Do not open files that are from people you don't know. Some people lie online. Do not have online mates you have not personally talked to first. It’s never too late to tell someone if something makes you feel uncomfortable. There are people who can help. 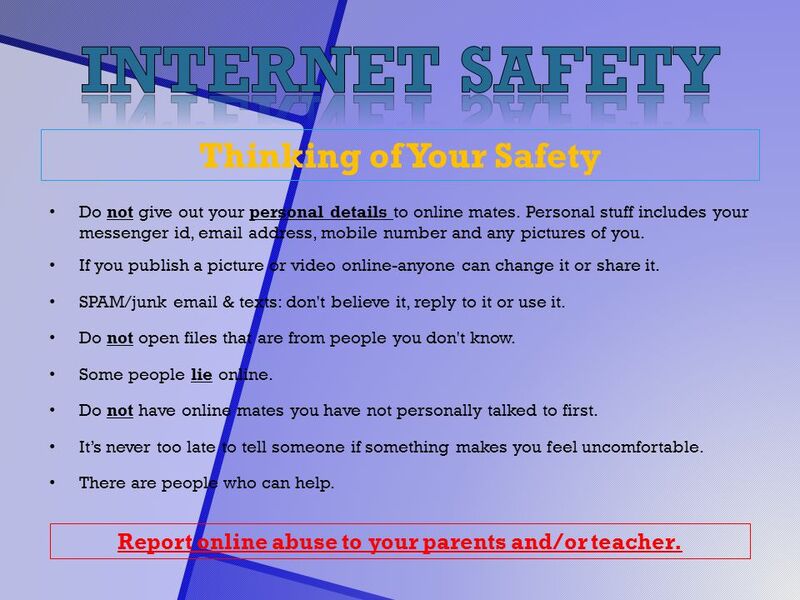 Report online abuse to your parents and/or teacher. 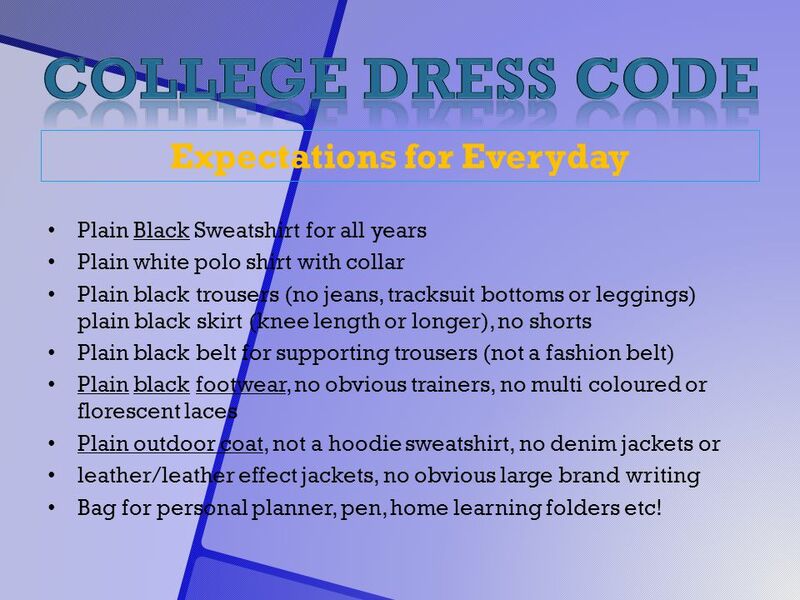 6 Expectations for Everyday Plain Black Sweatshirt for all years Plain white polo shirt with collar Plain black trousers (no jeans, tracksuit bottoms or leggings) plain black skirt (knee length or longer), no shorts Plain black belt for supporting trousers (not a fashion belt) Plain black footwear, no obvious trainers, no multi coloured or florescent laces Plain outdoor coat, not a hoodie sweatshirt, no denim jackets or leather/leather effect jackets, no obvious large brand writing Bag for personal planner, pen, home learning folders etc! 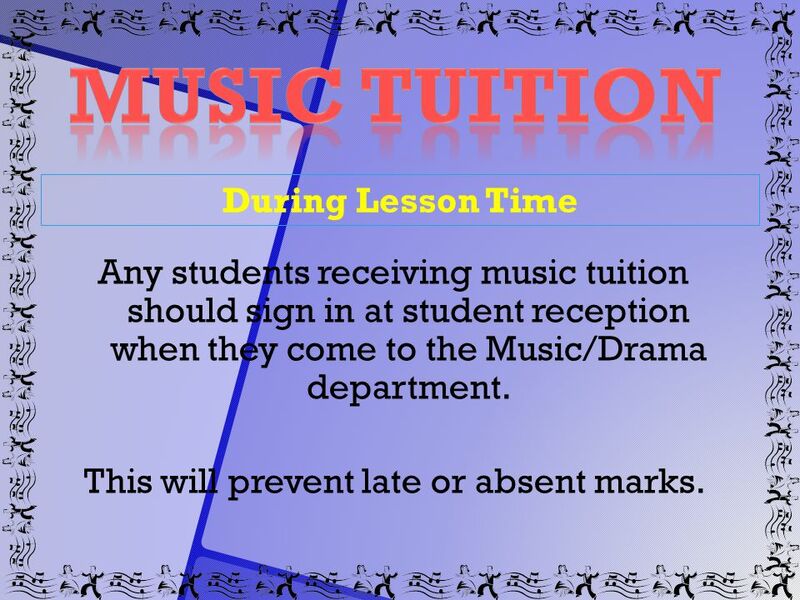 13 During Lesson Time Any students receiving music tuition should sign in at student reception when they come to the Music/Drama department. 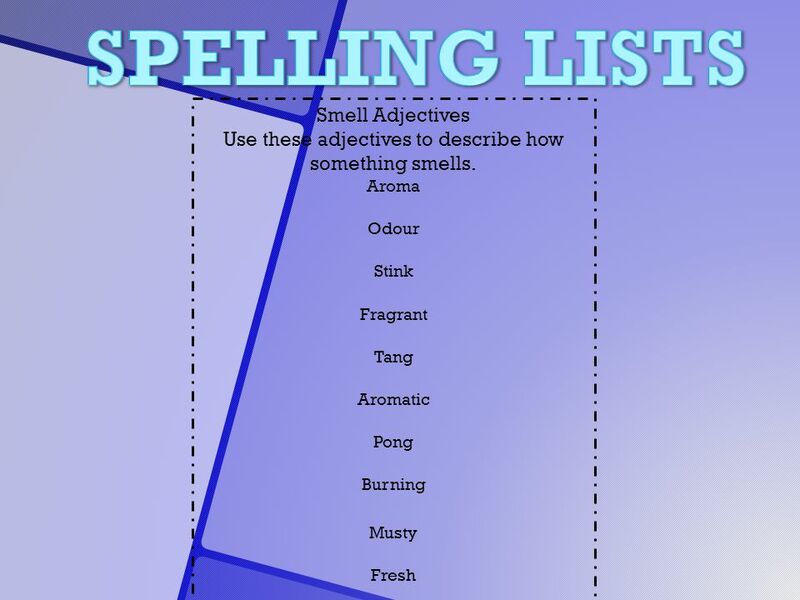 This will prevent late or absent marks. 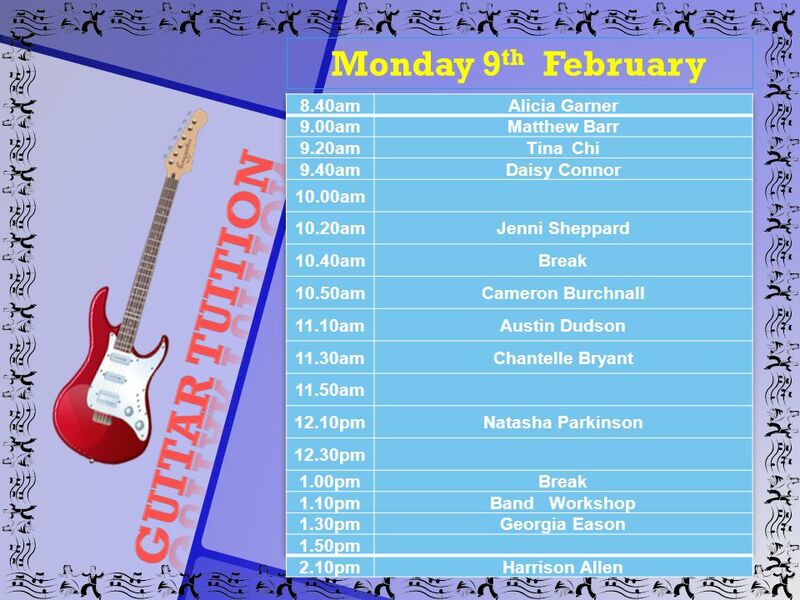 14 Individual Tuition During Lessons and After School If you are interested in one-to-one music tuition lessons (guitar, keyboard, drum), please speak to someone in the Drama/Music department and collect a letter. 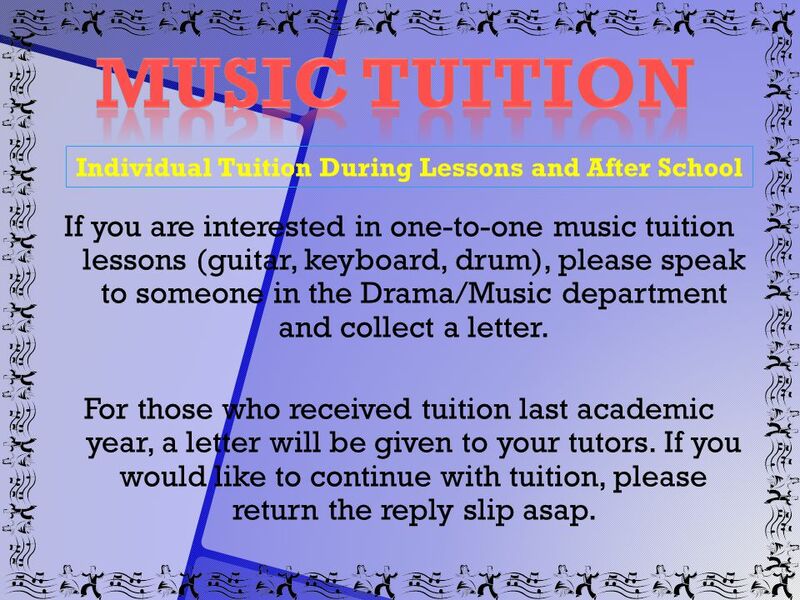 For those who received tuition last academic year, a letter will be given to your tutors. If you would like to continue with tuition, please return the reply slip asap. 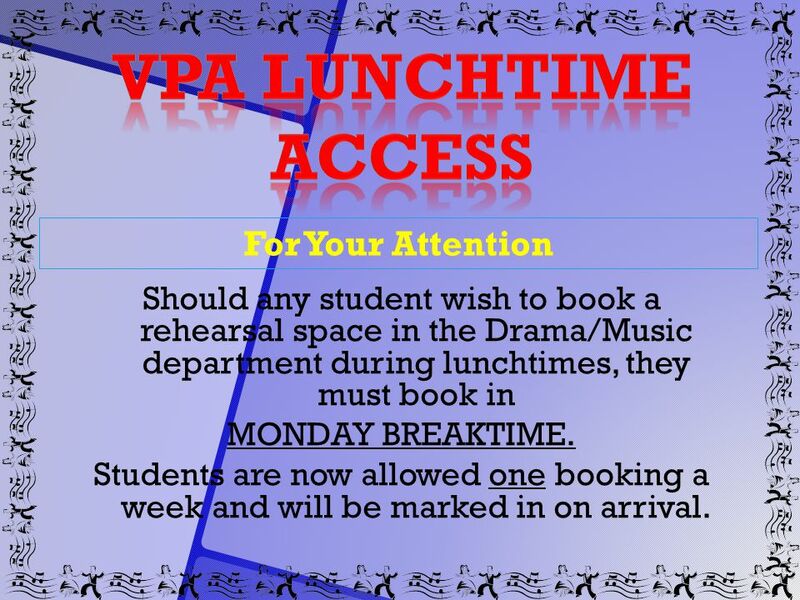 15 For Your Attention Should any student wish to book a rehearsal space in the Drama/Music department during lunchtimes, they must book in MONDAY BREAKTIME. Students are now allowed one booking a week and will be marked in on arrival. 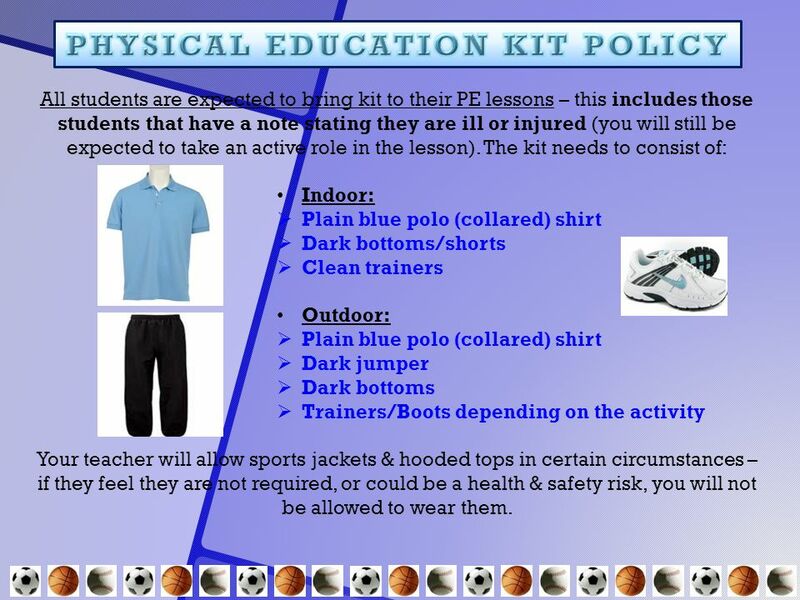 19 All students are expected to bring kit to their PE lessons – this includes those students that have a note stating they are ill or injured (you will still be expected to take an active role in the lesson). 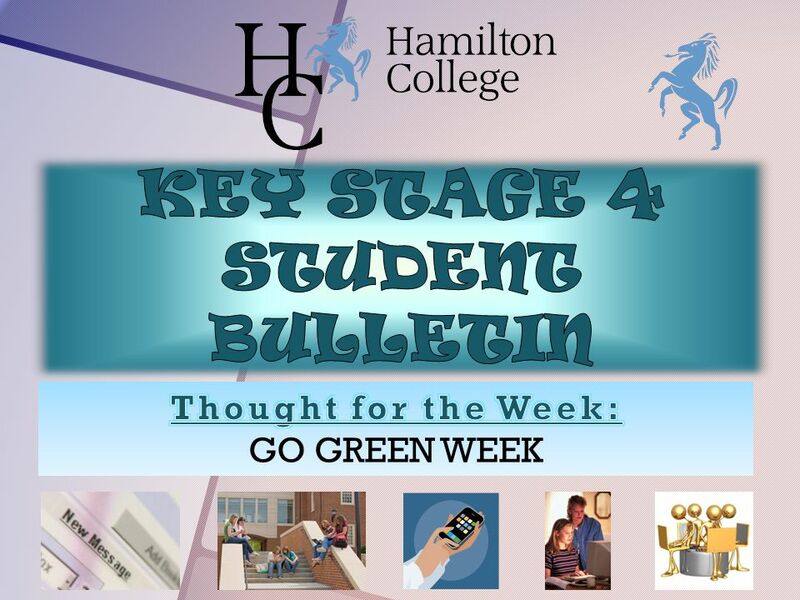 The kit needs to consist of: Indoor:  Plain blue polo (collared) shirt  Dark bottoms/shorts  Clean trainers Outdoor:  Plain blue polo (collared) shirt  Dark jumper  Dark bottoms  Trainers/Boots depending on the activity Your teacher will allow sports jackets & hooded tops in certain circumstances – if they feel they are not required, or could be a health & safety risk, you will not be allowed to wear them. 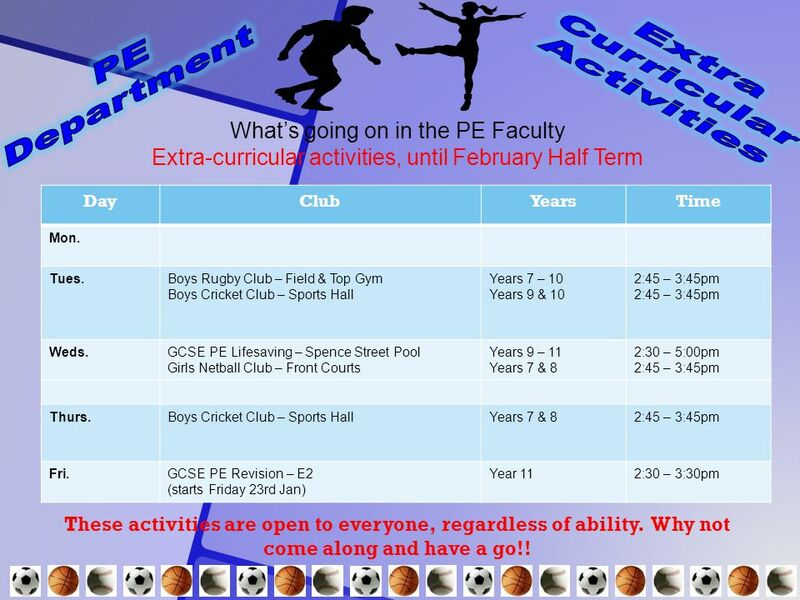 20 What’s going on in the PE Faculty Extra-curricular activities, until February Half Term DayClubYearsTime Mon. Tues.Boys Rugby Club – Field & Top Gym Boys Cricket Club – Sports Hall Years 7 – 10 Years 9 & 10 2:45 – 3:45pm Weds.GCSE PE Lifesaving – Spence Street Pool Girls Netball Club – Front Courts Years 9 – 11 Years 7 & 8 2:30 – 5:00pm 2:45 – 3:45pm Thurs.Boys Cricket Club – Sports HallYears 7 & 82:45 – 3:45pm Fri.GCSE PE Revision – E2 (starts Friday 23rd Jan) Year 112:30 – 3:30pm These activities are open to everyone, regardless of ability. Why not come along and have a go!! 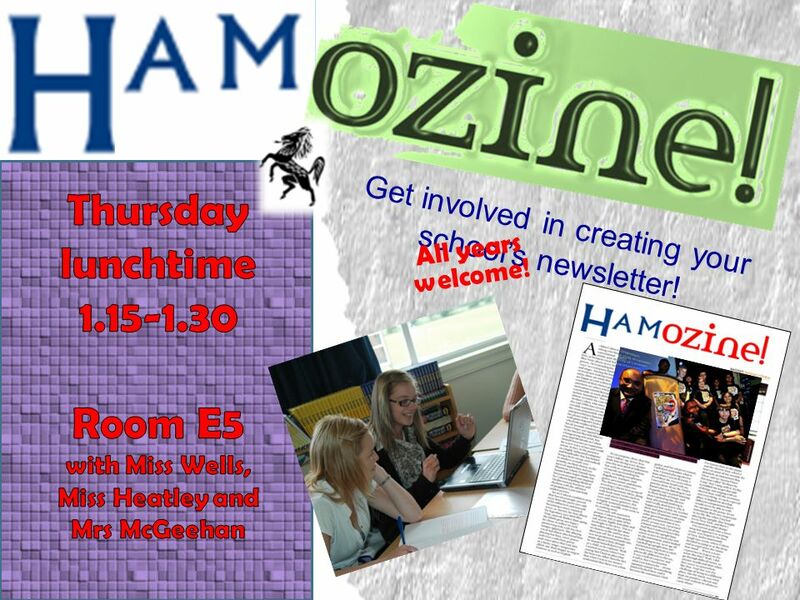 21 Get involved in creating your school’s newsletter! All years welcome! 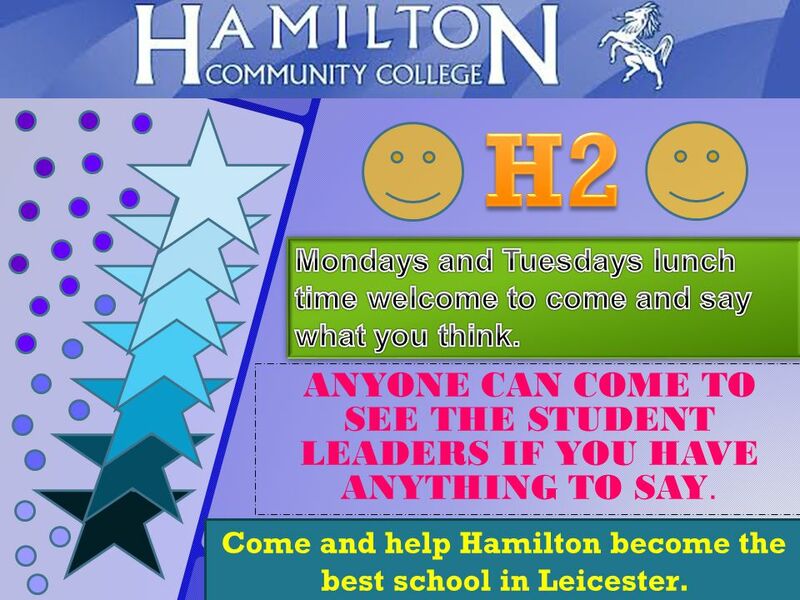 23 Come and help Hamilton become the best school in Leicester. ANYONE CAN COME TO SEE THE STUDENT LEADERS IF YOU HAVE ANYTHING TO SAY. 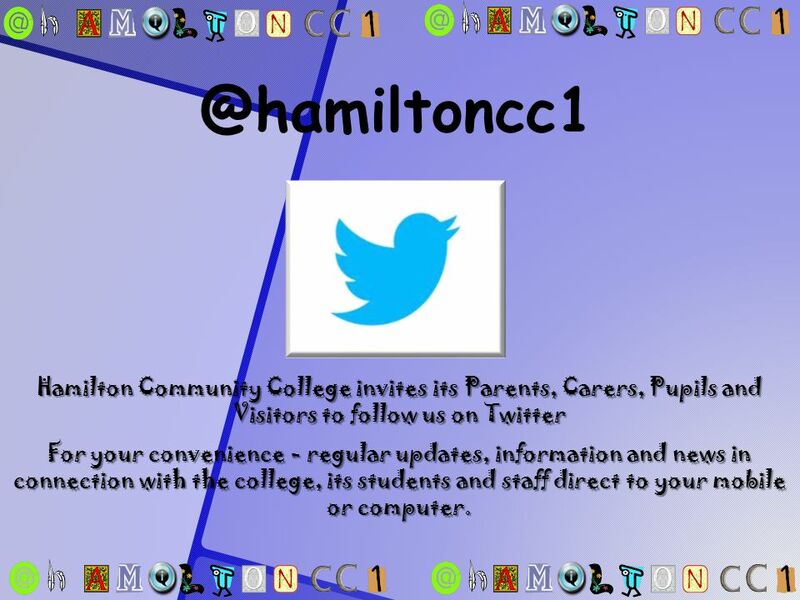 25 @hamiltoncc1 Hamilton Community College invites its Parents, Carers, Pupils and Visitors to follow us on Twitter For your convenience - regular updates, information and news in connection with the college, its students and staff direct to your mobile or computer. 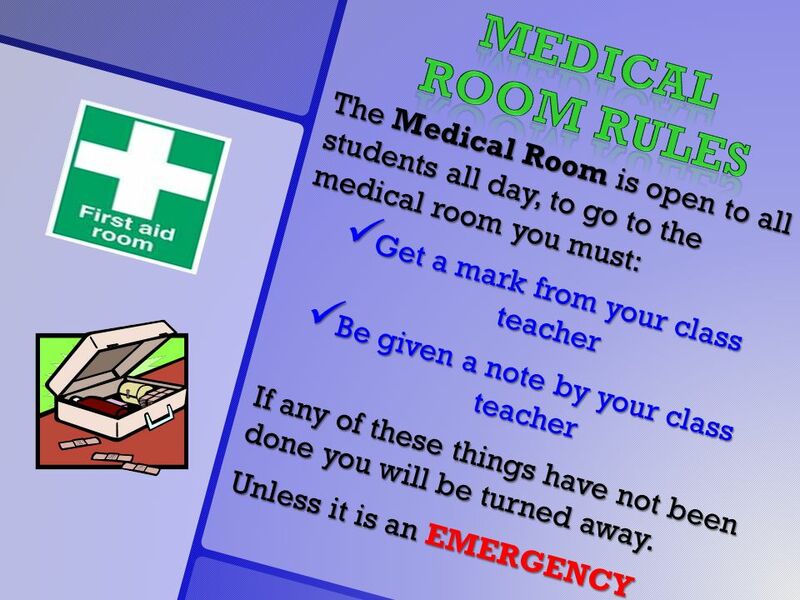 28 Once you have been seen by a member of staff, if you are well enough you will be sent straight back to class. 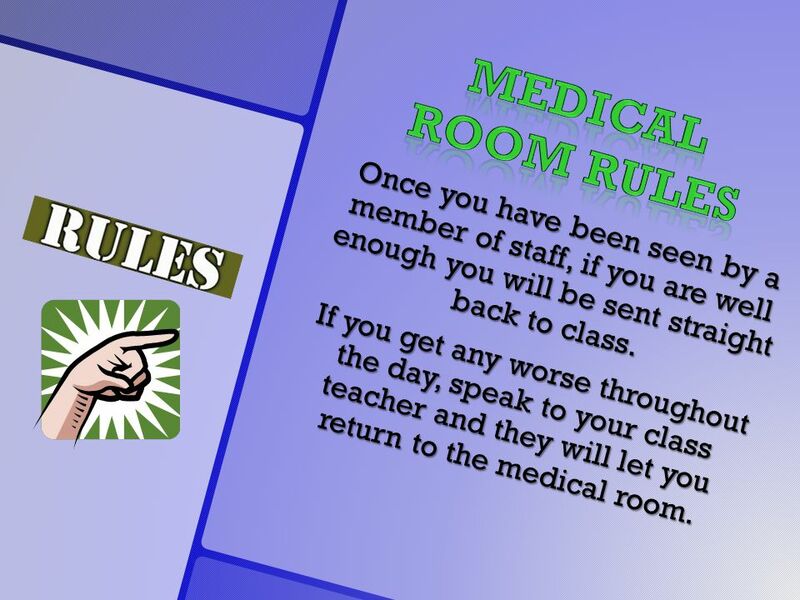 If you get any worse throughout the day, speak to your class teacher and they will let you return to the medical room. 29 If the member of staff feels you need to go home, parents or guardians will be contacted for you to be collected from school. 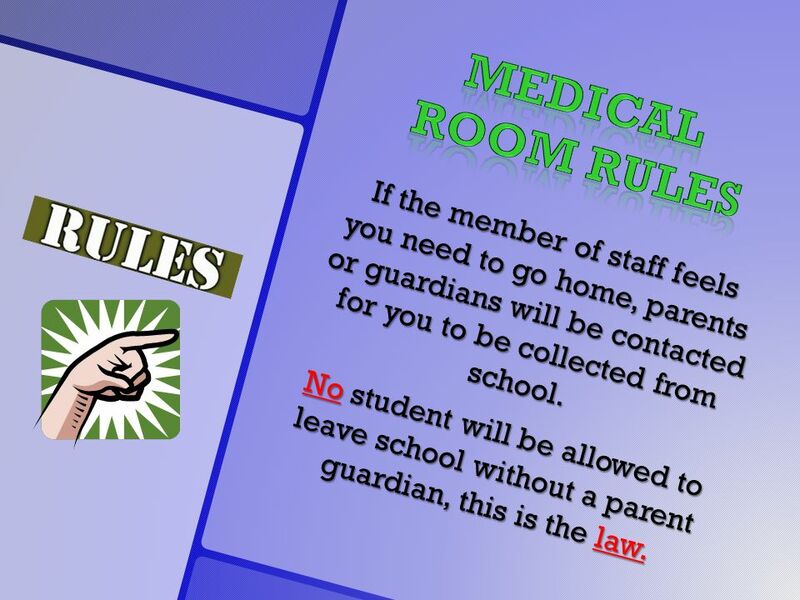 No student will be allowed to leave school without a parent guardian, this is the law. 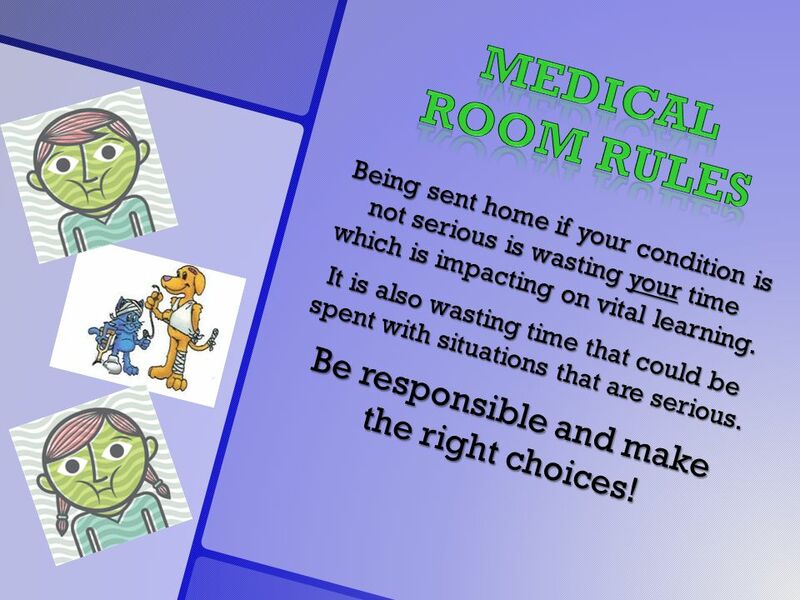 30 Being sent home if your condition is not serious is wasting your time which is impacting on vital learning. It is also wasting time that could be spent with situations that are serious. Be responsible and make the right choices! 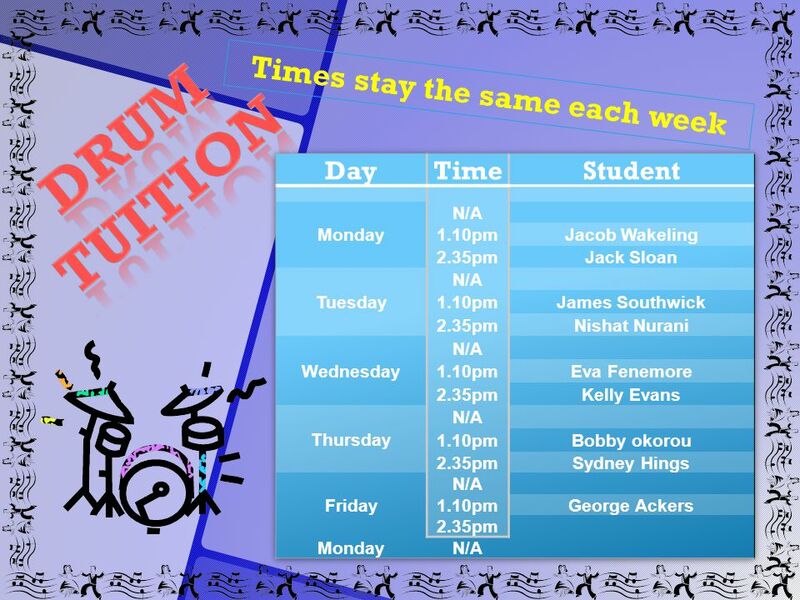 Download ppt "MON 9 th February Y11 Assembly – Main Hall CANCELLED Beaumanor House Assembly – Learning Forum P1/2 Y11 Maths Paper 1 – Hall/Gym 1.10 pm MP6 Club L2 TUES."
REMEMBER We wear a uniform because we are all part of the same TEAM Also, we wear a uniform so that we are all equally equipped to meet the challenges. Mrs. Beaumont, Mrs. Jarvis/Mr. Ife Literacy NumeracyScience I.C.T. PSHE R.E. Geography History French Music P.E. Games. 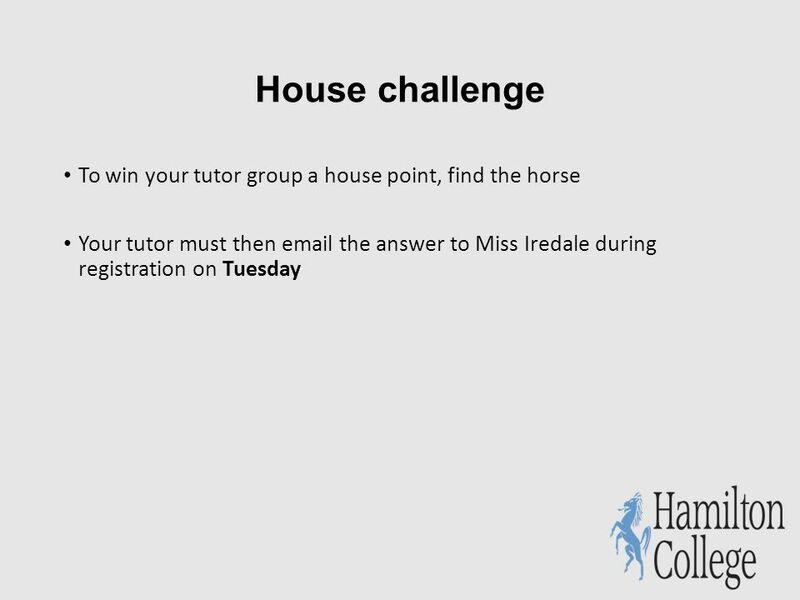 To do this you need to make sure...  you are in school and in lessons on time, every time. 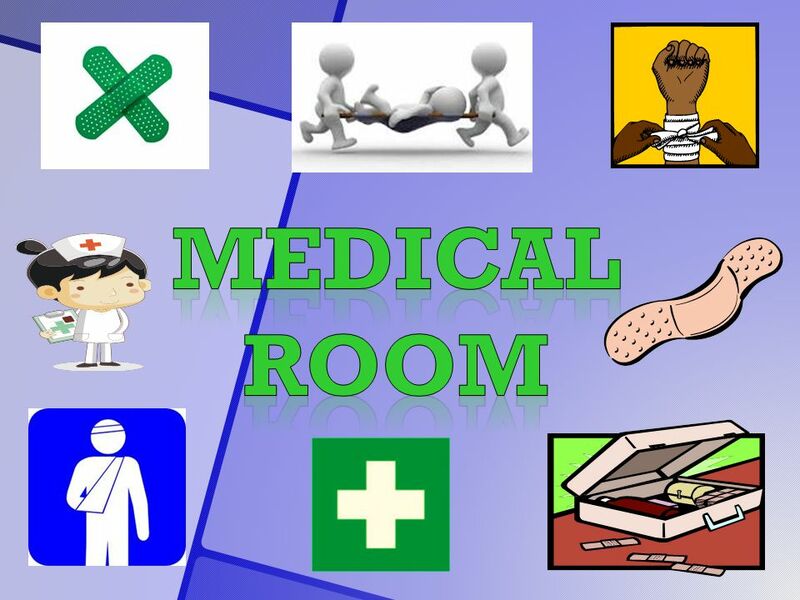  you are ready to learn with correct equipment for lessons. Welcome to 7(enter your form) 7(your learning managers initials) I am (Learning manager) I am your child’s learning manager They will see me on a daily. 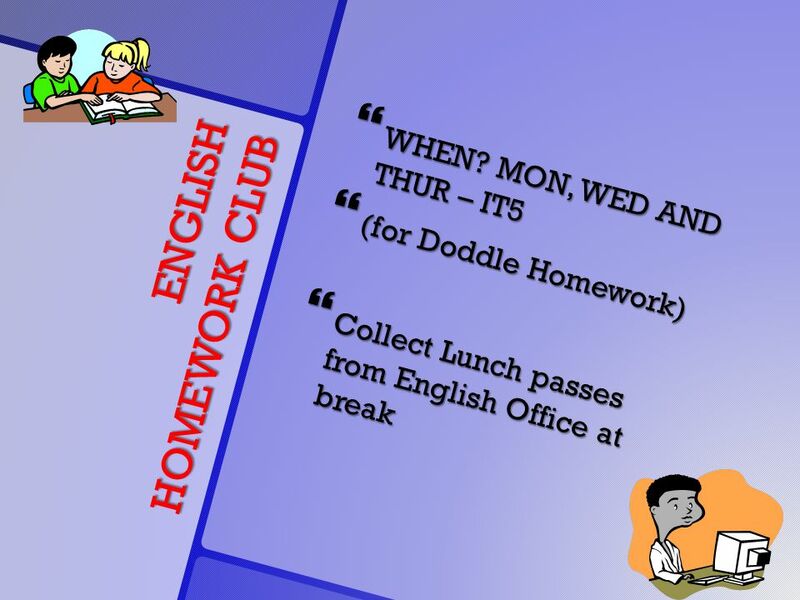 MON 2 nd March 1.10 pm MP6 Club L2 TUES 3 rd March 1.15 pm Languages Club in MFL2 2:30pm SEN Homework Club in G3 (Homework Help, crafts, fun!) – Learning. 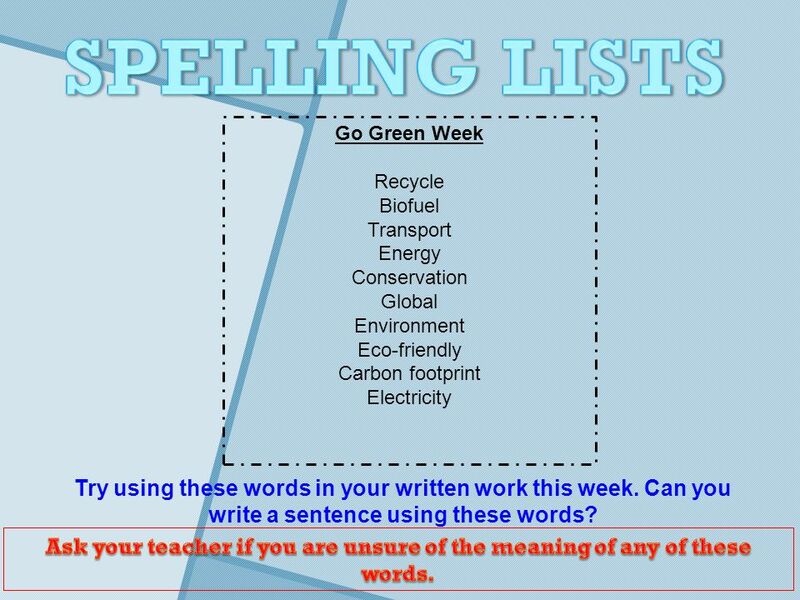 MON 23 rd February Y7-Y9 Track in 1.10 pm MP6 Club L2 TUES 24 th February 1.15 pm Languages Club in MFL2 2:30pm SEN Homework Club in G3 WED 25 th February. 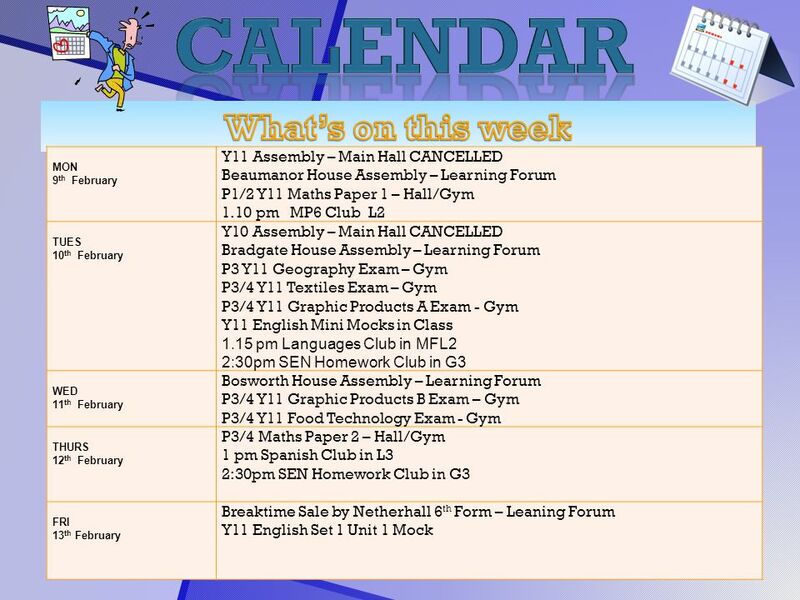 MON 2 nd March Y11 Assembly – Main Hall (MK) P1-4 Y11 Core Science ISA, WY’s 11S4 grp P1-4 Y10 ISA, MN & QA grp 1.10 pm MP6 Club L2 TUES 3 rd March Y10. New Intake Information Evening Tuesday 13 th and Wednesday 14 th May 2014. Shevington High School Standards. Uniform All students are expected to be in FULL Shevington High School uniform whilst inside the building. This includes. MON 1 st September Y11 Assembly – Main Hall (MS) TUES 2 nd September 1.15 pm Languages Club in L2 Y10 Assembly – Main Hall (MS) WED 3 rd September 1:10pm. S1-S6 ZUMBA CLASS Wednesdays PE Department See Miss Murray. 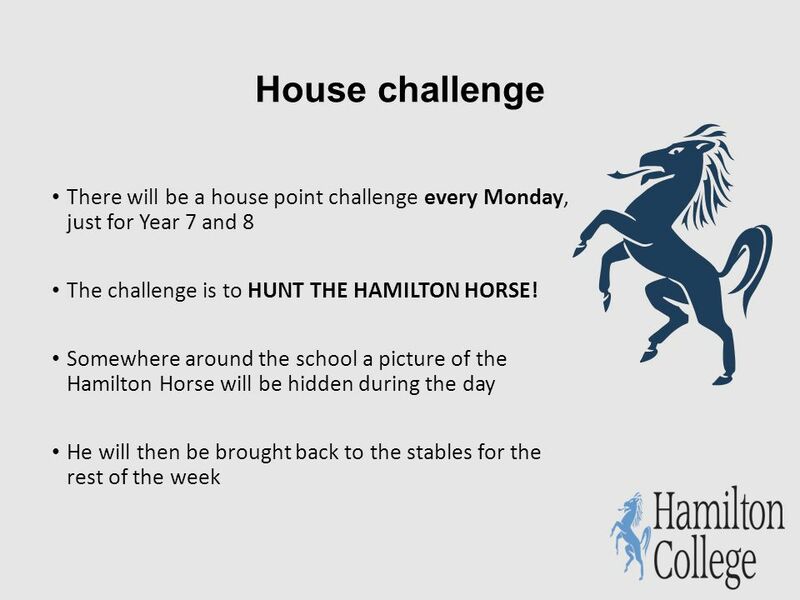 MON 9 th February Beaumanor House Assembly – Learning Forum Y7-Y9 Track 2 starts 1.10 pm MP6 Club L2 TUES 10 th February Bradgate House Assembly – Learning. Welcome to Foundation Teacher: Miss Horth Support Assistants : Miss Wetherall and Mrs Mohan. 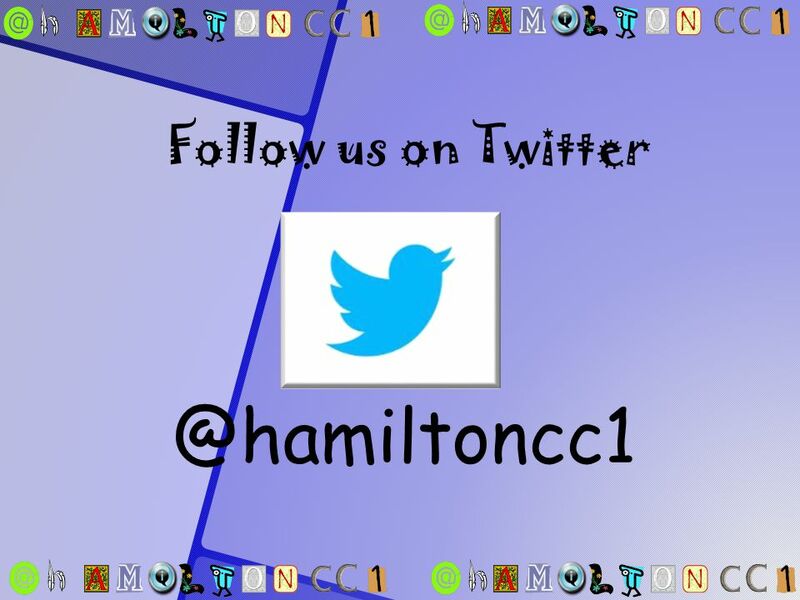 MON 1 st September TUES 2 ND September 1.15 pm Languages Club in L2 WED 3 rd September Y9 Achievement Assembly – Main Hall (MS) Y7 Assembly – Community. MON 20 th April Y11 Assembly – Main Hall CANCELLED 1.10 pm MP6 Club – L2 P5 Y11 Arabic Speaking Exam Preparation TUES 21 st April Y11 Assembly – Main. SQA Examinations 2013 The Waid Academy 1 Essential Information & Guidance for Candidates. 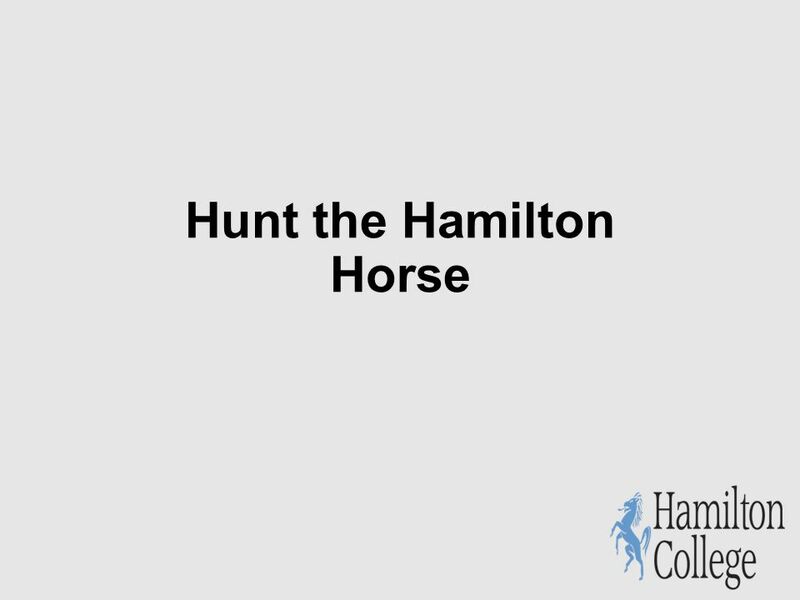 Virtual Tour of Sandhurst School by Kiera Cherrington Press F5 on your keyboard and then click on the arrow to begin the school tour Virtual Tour of Sandhurst. 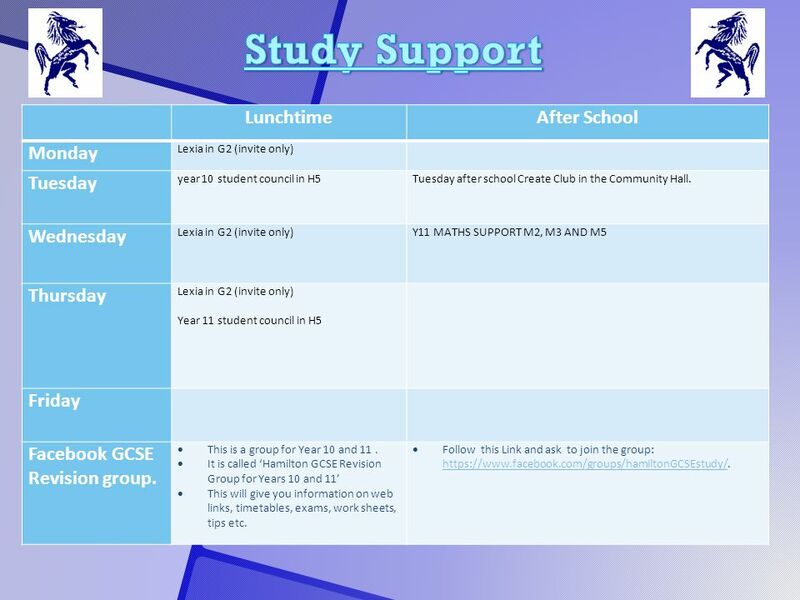 MON 27 th April Y11 Assembly – Main Hall (DA) P2 Music Recitals IR Group – Arc 6 students P3 Music Recitals IR Group - Arc 6 students 1.10 pm MP6 Club. Key Dates and arrangements for the remainder of Year 11. Welcome to UKS2! Parent Information Evening. 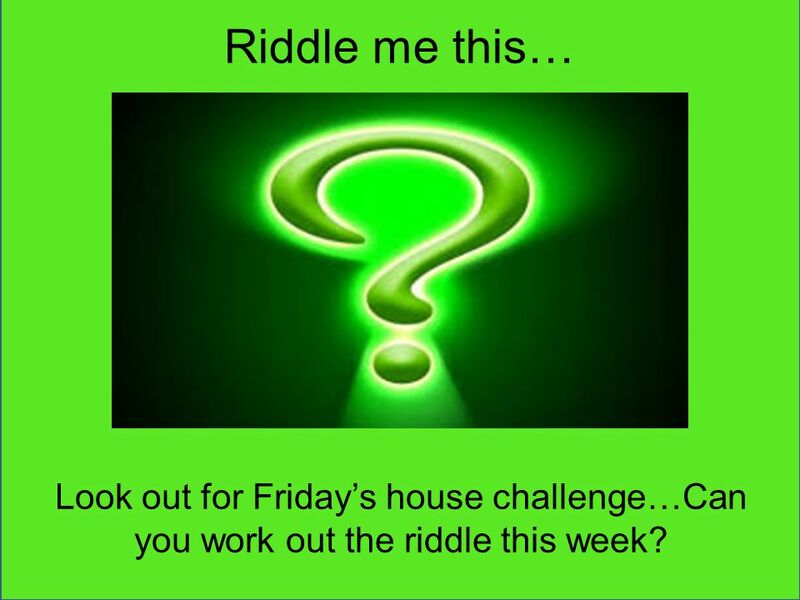  Mrs Sudera  Ms Williams  Mrs Snell  Miss Lenton  Mrs Wallington (HLTA) Mrs Darby Mrs Morpeth Mrs Lewis. 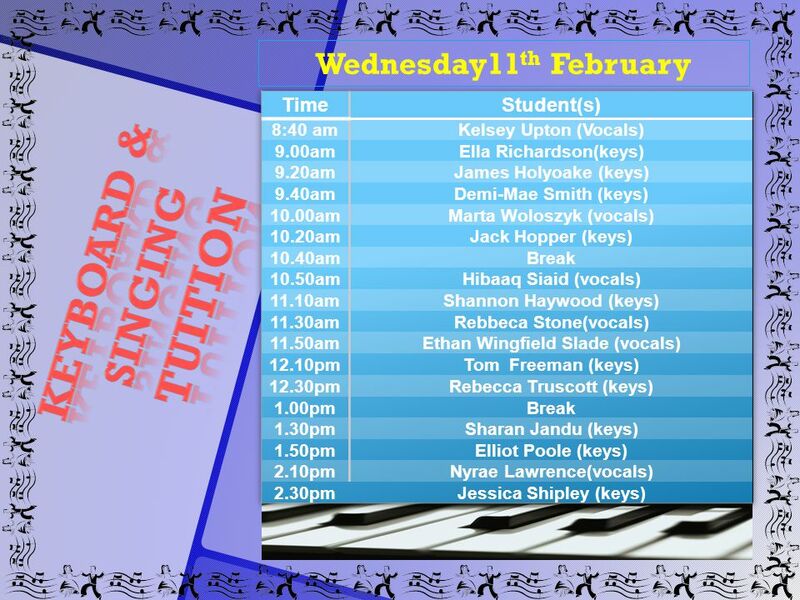 Year 11 Tuesday March 3 rd 2015. 1. 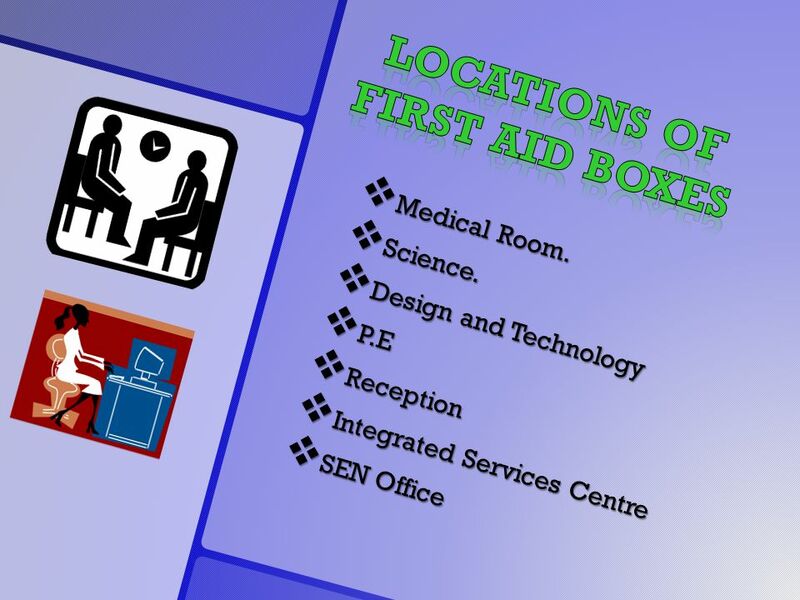 To give information about exams, revision sessions and final practical exams. 2. To give some advice about revision.